Integrated Automated System for or Monitoring and Alerting Vehicle Pollution Hariprasath. M Department of Electrical and Electronics Engineering, Bannari Amman Institute of Technology, Tamil Nadu, India ABSTRACT In the growing global economic environment, road transportation is one of many factors that determine the economic resources of a country. This will result in economic growth, the fulfillment of needs, and a favorable environment for employment. Ho However, the environmental disorder has caused air pollution, noise pollution, light pollution, thermal pollution. This creates great damage to the individual and the environment. There are currently various types of equipment’s and regulations to prevent or reduce this. But there are several practical problems in implementing them. Lot of researches is taking place around the world to solve these problems. One of these is the INTEGRATED AUTOMATED SYSTEM FOR MONITORING AND ALERTING VEHICLE POLLUTION. TION. The main purpose of this system is to monitor air pollution, noise pollution, light pollution and thermal pollution when vehicles violate traffic rules, using the microcontroller, sensors, GSM GSM-GPS and LCD display, and the vehicle will send the messagee to the RTO / Control Room within the area and the Owner of the vehicle. Furthermore, the above message is displayed in the LCD display on the vehicle's dashboard with the cell phone number of the nearest service center. The driver / owner of the vehicle must provide the vehicle for service and provide an explanation for the relevant officer within a specified period. These will be recorded on the vehicle’s service record if not given proper description. Furthermore, by taking legal actions, environmental degradation and accident can be reduced and make road transport safe and secure. I. INTRODUCTION India is one of the largest countries in the world for road transport. The he number of vehicles registered in India on March 2017, was 252354000. This is much higher than the vehicle number 201491000 on March 2016.Thus, Thus, the number of vehicles in India is increasing every year. Of course, this reflect the growth of the country.. At the same time, it creates huge repercussions like air pollution, noise pollution, thermal pollution and photo pollution. Air pollution creates respiratory irritation, lung diseases, cough and wheezing problems for people. And also, this air pollution causes different types of environmental impacts. When use the horns more than the limit allowed in the vehicles, the ear is causing dullness and air noise problems. Sometimes it leads to accident when the exceeded limit horn is used. use Thermal pollution causes various problems, like skin cancer, and various environmental impacts in the environment. Furthermore, accidents can be triggered by the motorist ist when they use powerful headlights with more light intensity than the permitted levels lev and it also causes es damage to the eyes and affects the environment. In considering this, the Government has passed legislation in the last 2017, directing the new vehicles to matching the BIS (IV) standard to reduce pollution. But there are many practical problems in monitoring and detecting the old vehicles which are not maintained properly which causes ca much pollution to the environment. 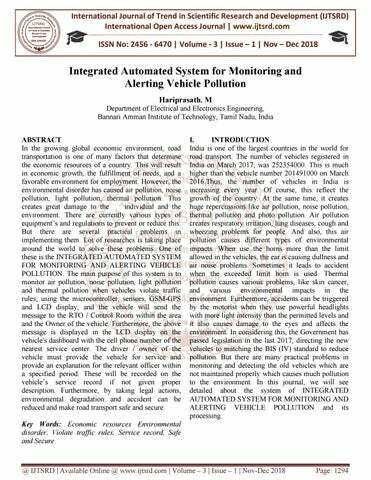 In this journal, we will see detailed about the system of INTEGRATED AUTOMATED SYSTEM FOR MONITORING AND ALERTING RTING VEHICLE POLLUTION and its processing. 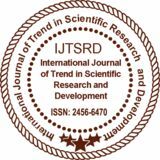 International Journal of Trend in Scientific Research and Development (IJTSRD) ISSN: 2456-6470 2456 II. same time the voice alter in the dashboard is designed to alert. At the same time, it is designed to send the same information to the nearby control room / RTO office and the owner of the vehicle. If the vehicle is running when the alert mode is present, the information will be recorded in a five minutes interval at the microcontroller kit and control room / RTO Office. This five-minute minute interval can be adjusted to the time that the government determines. If the sensors do not reach the threshold level the display, displays that there is no problem found and displays the locality of the vehicle. This information is also sent to thee control room/RTO office.